From opulent to natural, lacy to geometric, curtain trends for 2015 are fashionably eclectic. Blurred lines and painterly patterns are hot trends, while moody indigos and metallic shimmers move into focus. Versatility is the key, as the season's rich textural fabrics weave classic with modern, luxurious with natural. "Two main themes we're seeing in curtain design are opulence, such as metallics and rococo-like lace fabrics, and natural – a calming, revitalising theme," says Bianca Gardiner, product manager for Mollers. "The first sees a return to luxury. Opulence, beautiful, well-crafted finishes and textures – think marble, metals, lace and velvets. The second is calming, relaxing and embracing, featuring soft textures, natural fabrics, revitalising objects, and relaxing greys and blues." 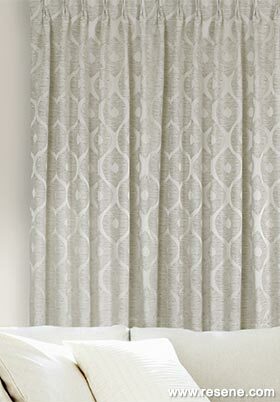 Both trends feature in Resene's new curtain range, which echoes the very latest in interior design. Developed in partnership with Mollers, this collection delivers both luxuriousness and cosiness. "The home needs to be really nurturing, so while many of Resene's fabrics have designer appeal, others have a very natural feel to make people feel embraced by their interior." Think nature, think botanicals, and in particular, think painterly florals. "People love flowers and nature around them. They are looking for things that have that connection to the natural world. And with the advent of digital printing, now people can do a watercolour print and turn it into a textile design. We're seeing a lot of hand-painted florals and abstract designs, painterly designs like Matisse or Cezanne that show the brushstrokes. They are not as structured as other prints; they have a softness to them." We can see this in Resene's Watercolour design, a large-scale hand-printed floral. It's printed on a hemp cloth too, giving an earthy, natural look. The new Watercolour design is an indigo colourway, which is very on trend. Indigo, shibori techniques and traditional Japanese inspired looks are coming through many natural style fabrics. The new Coral design is also printed on hemp, and stays with the natural theme. "It's kind of an undersea aquatic idea, like a coral head, with two different colours, red and grey, on the one fabric. Nature comes through with that design as well." The red, which matches Resene Pohutukawa paint, is right on trend, and an ever-popular colour. 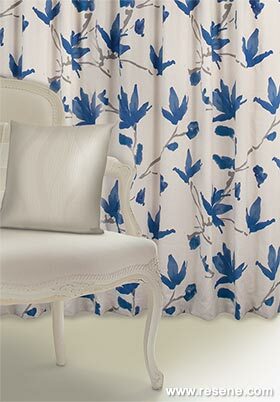 Also hinting at nature is Verde, a curtain with a large-scale, mid-century-influenced abstract leaf. 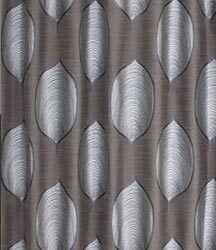 The intricate woven details inside the leaf work beautifully with a natural textured background. "One of the colourways has quite a paua colour in the back of it, like a blue, which is really lovely," says Bianca. "And Verde also has a bronze and platinum colourway. Copper and bronzes are becoming quite big in interiors again, and there is a subtle plays on those metallics." The trend towards the playful, personal home interior is ongoing, with a blend of styles and mix-and-match furniture bringing comfort to the homeowner. It means a complete reshuffle of the rulebook, with a strategic, ‘layered' mix of textile designs. 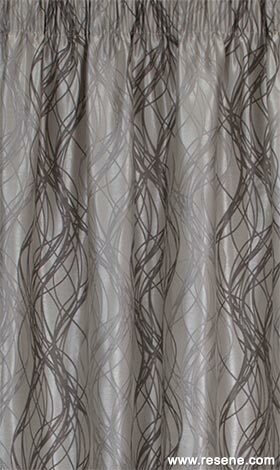 "Resene has a new design for 2015 called Safari, which is kind of reminiscent of foliage or animal stripes," says Bianca. "It's neither, but it has that feel to it. It's perfect for an exotic, eclectic interior. It's kind of like a traditional, opulent, over-the-top decorating style. People are now mixing and matching that kind of style. You can put animal stripes with something else, something quite lace-like, for example. It used to be you couldn't put stripes with spots. But the rules are breaking down now with interiors, so Safari is a great one for those people who want to mix and match. It's quite a bold design. It's quite dramatic." Other opulent designs include Paradise and Chevron. "Paradise is an art deco inspired design with really soft colours – blue-grey, blonde and then in a charcoal as well," says Bianca. "It's very opulent and rich, and it has a lovely shine to it." 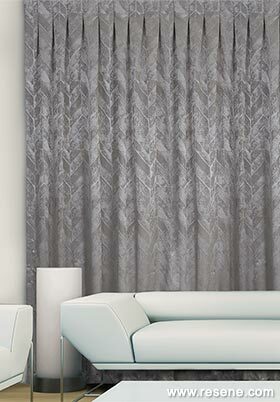 Chevron has a sophisticated geometric pattern and is available in three metallic tones. "It's very textural, almost like brushwork, but it's a woven print. It's slightly distressed looking." Chevron has a slight masculine feel, so it's perfect for ramping up the aesthetics of bachelor pads as well as modern family homes. Nano is another new design with designer-savvy texture. With a timeless colourway of Naturalle, it has repeating classic design that contrasts between shiny and matt. The contrast is subtle but adds a sophisticated panache to interiors. 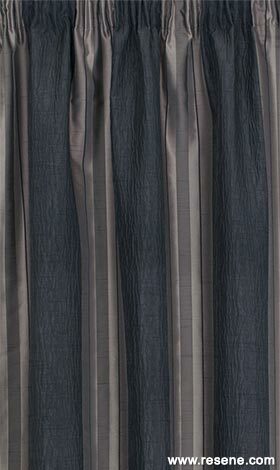 Following the very latest trends, indigo makes an appearance in the latest curtain range too. The dark colour has a versatility that sees it working well with many other colours. New colourways have been introduced to a couple of existing designs as well. Popular Tease, has a new blonde colourway, while Unison sees the addition of charcoal. Both these colours fit well with contemporary trends, providing an updated, polished look. While relaxing greys and blues are focused trends for 2015, neutrals still play a role in many interiors. "We know the neutrals will always sell," says Bianca, "but it's nice to put in these other colours to give people an option. 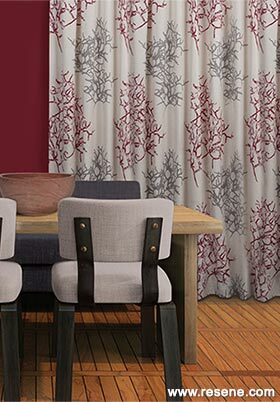 Resene's Pohutukawa, for example, fits in well with Pantone's Colour of the Year, Marsala, and we have quite a lot of that in the Resene curtains. People love a bit of red." 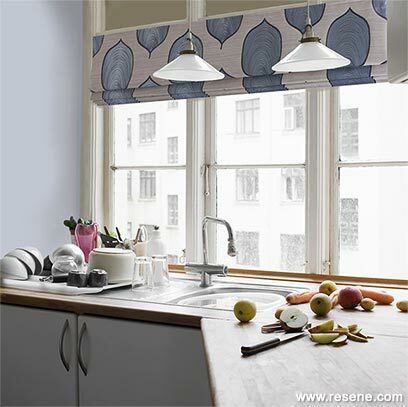 2015 also brings the launch of Resene's new Roman blind service this year. 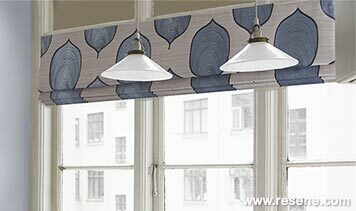 Roman blinds are a superb way to update any living space quickly, and a great way to showcase a print fabric, or for use as an alternative option when curtains don't work. 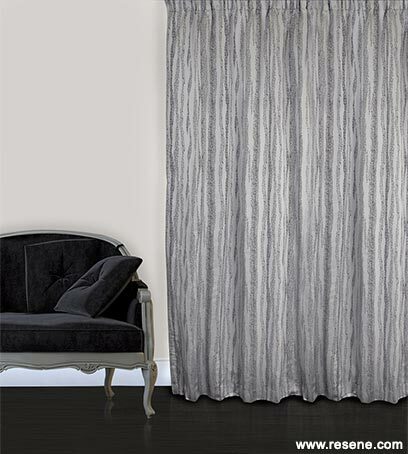 Resene Curtain Collection fabrics and curtains are available in NZ only from Resene ColorShops and selected curtain specialists.